The stage is set for a memorable end to the year. The North American leg of the 2016 Capcom Pro Tour came to a thrilling conclusion this past weekend with the Red Bull Battle Grounds event in Seattle. A high-budget, extremely well produced event that was well above the usual hotel function halls that usually host these sorts of things, this was more akin to a TV game show. Over the year, fourteen players from around the World qualified for this last chance to get into the Capcom Cup, with two players—Japanese Street Fighter legend Tokido and RB, who has been fairly quiet so far in SFV—joining the tournament by finishing 1st and 2nd in a ‘Last Chance’ qualifier the night before. It was one of the best nights of Street Fighter V action to date, with a wide variety of characters on show, all played at the highest level of skill. A great taster of what we should expect to see at this year’s Capcom Cup, which is now mere weeks away. Here’s the five real talking points coming out of Red Bull Battle Grounds. The star of the weekend was without question RB, who stormed through the competition with his Urien, the last of the DLC characters and one that has yet to make a real impression on the Pro Tour. This opened a lot of people’s eyes in regards to Urien’s place on the current tier list—turns out, he’s really bloody good. 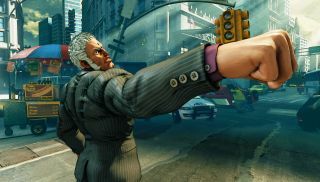 However, it takes a great player like RB, who has an understanding of Urien’s dangerous and effective normals as well as his flashy mixups and complex resets and can utilise them in the heat of battle, to truly take the character to the highest levels. It’s important to see this stuff coming through so early in the game’s lifespan, because the common narrative is that the DLC characters simply aren’t as good as the base ones, perhaps because Capcom played it safe and didn’t want to release a new character mid-season that totally broke the meta. The jury (sorry!) is still out on Juri and Ibuki, but after this event, it is clear that Urien is a very, very good character that causes the rest of the roster a lot of problems. The breakout performance of the weekend belongs to ANBU | Punk. He qualified for this tournament by, somewhat hilariously, finishing as a runner-up in one of the US Online events. There was some question as to his abilities as a top-level player and whether or not he should even be in this tournament. That was a question that was answered emphatically. In his first match, he beat Filipino Champ, who was the player who beat him in the final of that online event. He then beat Chris Tatarian 3-0 to proceed into the semi-finals, a very impressive win over one of America’s best Ken players. It was the semi-final matchup that put everyone on notice. In a Karin v Karin mirror match, Punk defeated Evil Geniuses’ Justin Wong—currently the highest ranked American player—3-0 in straight matches. It was a dominant performance against a Street Fighter legend. Punk lost in winner’s final to Tokido and then was eliminated by NuckleDu, meaning that he missed out on a Capcom Cup spot but it'd be foolish to see this as anything less than a real statement by a previously lesser-known player. He’s also eighteen bloody years old! Has anyone had a bigger turn around in 2016 than NuckleDu? After a fairly slow start to the Pro Tour, he’s become arguably the best player of the lot and seems to be peaking in these weeks prior to Capcom Cup. A very good thing for US Street Fighter, as NuckleDu has become not only the first American to win a Premier event in Capcom Pro Tour history, but also the first to win two. Some of the cleanest Guile play seen to date saw him recover from a first round loss to Tokido, fight all the way through loser’s bracket, beating Chris Tatarian, Alucard, K-Brad and Punk—most of those 3-0, too—to set up a Grand Final rematch with Tokido. It was an emphatic victory. Resetting the bracket and winning both sets 3-1, NuckleDu stamped his name at the top of the list of US players. Maybe not in terms of global ranking, but certainly in the minds of his peers and fans of the Pro Tour. There were moments in the match where Tokido simply looks a bit lost. Like he couldn’t find his way through the way Du mixed up Guile’s offense and defense. Again, much like RB and Urien, Du—alongside Imstilldadaddy—is showing everyone that Guile is a strong character. In terms of momentum, no one has more heading into Capcom Cup than NuckleDu. Based on this performance, it’d be hard not to see him going all the way. A winner this past weekend, without actually doing much at all. Ryan’s hard work had already been put in with some convincing displays around Europe, but he hadn’t quite gotten hold of that elusive Capcom Cup spot. However, with winner NuckleDu already qualifying with his Premier win at Canada Cup, this freed up a new qualification spot on the Global Leaderboard. This went to Belgium’s CCL, who had already qualified through points on the European Leaderboard, so this freed up his slot there. With Ryan having some discussed retirement recently, it’s going to be excellent to see the UK’s real FGC legend have what could be one last crack at the big prize. Remember his incredible match against NuckleDu in 2014? Both men are at very different stages of their Street Fighter career, but I’d watch that again, wouldn’t you? Getting bodied by NuckleDu in Grand Finals must’ve hurt a bit, but seeing your main character—Akuma—being announced for the game immediately after must’ve softened the blow somewhat. Tokido’s Akuma was terrifying, the perfect accompaniment to his ‘Murderface’ and aggressive play style. Seeing these two reunited in Season 2 of Street Fighter V should be a lot of fun for viewers—and probably pretty worrying for the other competitors!